Simply fill out this form and we'll send you your free trial Transitions 5 Dimensions. Please check your email for your trial of Transitions 5 Dimensions. We can't wait to send you fully-functional, watermarked Transitions 5 Dimensions trial. Add depth and dimension to your cuts. Break, burst and shred between scenes with this action-packed plugin. Turns the scene into a series of bouncing "frames" that animate into the next. Shuffle, collapse and stack one scene away, then introduce the next. Minimize a scene into a shrinking box that floats and spins into the next. Smash, splinter and shatter an image to reveal the next scene underneath. Expand 3D objects across the screen, then crumble to reveal the next clip. Turn the first scene into a stack of window louvers that rotate to reveal the second scene. Scene evolves into spinning boxes with alternating shots that settles back into the second scene. 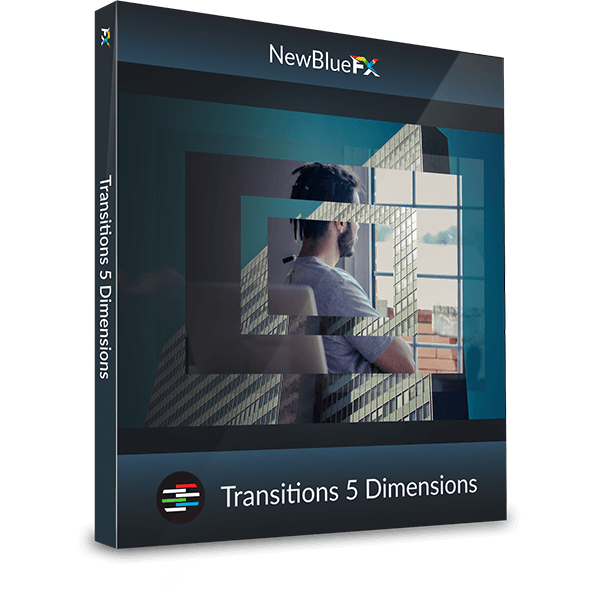 Transitions 5 Dimensions Works With Adobe Premiere Pro, After Effects, Magix Vegas, Avid Media Composer and many more. Add 3D transition effects like a pro — make it look sleek and smooth in no time. Pay less for Dimensions as a part of a bundle. Get a complete set of transition plugins at a great price.